If you've been following the MFT Blog over the last few weeks, you've seen lots of amazing Chibi Lights cards. These things are seriously cool to play with. 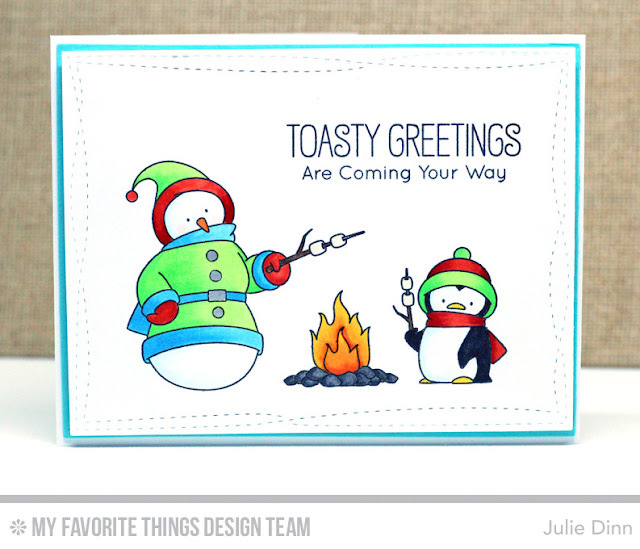 I created a fun little Christmas card with the adorable Toasty Greetings stamp set. It's a sweet and simple card until you add the Chibi Lights and it becomes something fabulous! Here you can see the fire all lit up. Doesn't that look cool? Be sure to check out the MFT Blog to see what the rest of the team created to share with you. Your fire does look toasty. Those lights look like such fun. Cute card, and I love your colors. So pretty with the lighted fire! !Love this one! Very cute idea and Ames me giggle! Creative use of the light! Wow! That Chibi light definitely makes the campfire look almost real - it definitely glows and shows off your beautiful colouring! Wonderful card! The flames light up so well! Adorable! Wow! I love your card and the campfire is amazing. Fantastic! OOooh! Love the campfire! Cute card! How adorable! Love the snowman and penguin and the lit fire! This is adorable!!! I LOVE how you used the light on this!! Such a cute idea!! Absolutely adorable! 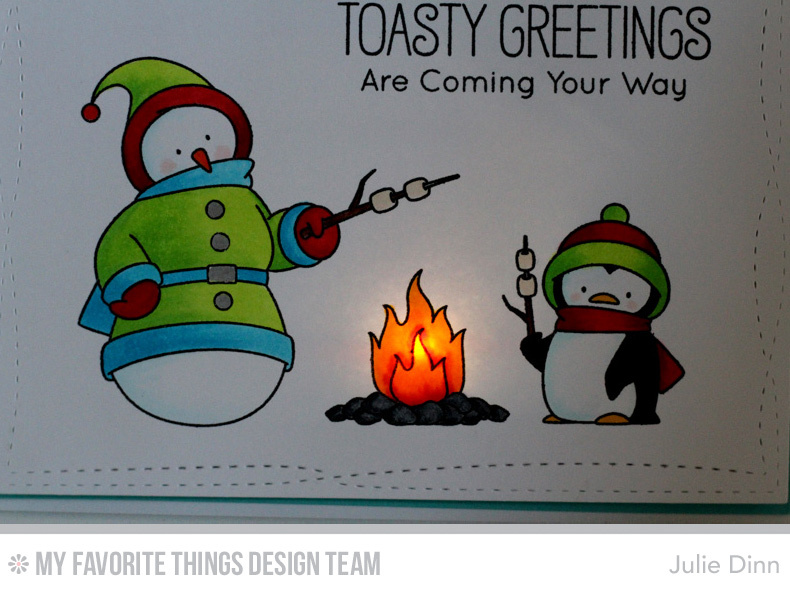 Love the snowman and penguin, and that awesome light-up fire! SUPER CUTE scene, FABULOUS colouring and SUPER FUN campfire light action - LOVE IT!!! .... I look forward to making bundles of light up cards, they look like FUN to make and FUN to watch as the recipients open them!!! I hope that snowman isn't standing too close to that raging and lit campfire! These little lights are so fascinating to me! I love how you used them to light up your fire! CUTE card. Thanks for the inspiration! That is just TOO cute! I can see these lights being used for Halloween, too.